Disruptive Innovator: Yes, I've Seen the Article. Did You Notice the Process? Yes, I've Seen the Article. Did You Notice the Process? "Have you seen this article in CMS Wire about SDL?" "Why yes, you're the fourth person to mention it." This post isn't about the content of the article or SDL's divestment news. For a good perspective on that, read a post referenced in the first article. 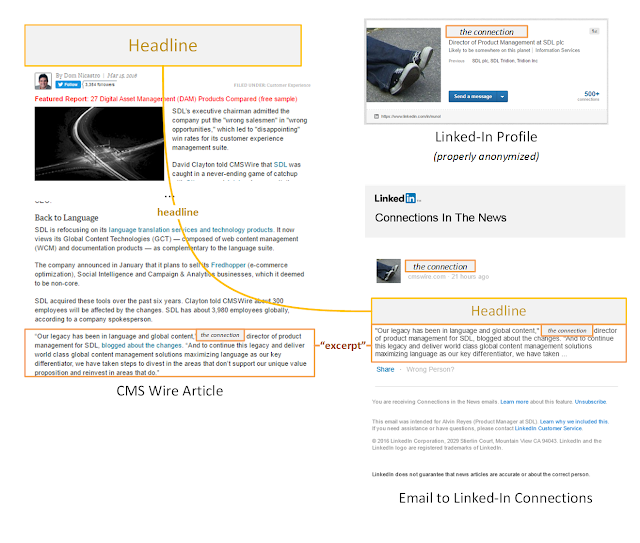 This post is about a Linked-In feature, semantics, and possibly micro-formats. So, how did you hear about the article? I don't see you mention the post about strategy shifts or this one about non-core units. I suspect you heard about it through the Mentioned in the News (Linked-In) feature that promotes online news stories about people to their connections using an AI algorithm. The article, the connection's profile, and an email. Notifying connections when you're in the news. As a Linked-In user, you can opt out of this feature as seen below. I find this fascinating in a few ways. Semantics. I'm not sure it's required to make the feature work, but the article uses microformats to mark the headline appropriately (itemprop="headline"). In addition to Google search results, this is a nice practical example of the more fuzzy term, semantics. Concrete. I suspect many are seeing the email and are interested in content labeled, "News about [your connection]." It's refreshing to see a direct connection mentioned rather than another link-bait title. This falls under the tip of using concrete details to create "sticky" messages. Subtle AI. I also suspect few stop to notice the article doesn't actually link to your connection's Linked-In profile. An automated AI program determined the connection based on (plain) text in a news article and then grabbed the headline as well as a reasonable excerpt from the article. Tracked. The links and images have querystring parameters likely for analytics, tracking, and/or possibly personalization features on Linked-In (which isn't really surprising). Not new. I'm late to the party. The feature was mentioned here and here. What Share Link? Despite the sharing link in the email, I ran across the article in Skype and Slack chat. Long live copy & paste! Creepiness averted. Offering user control is an important part of personalizing the customer experience. So, what did you notice when you or someone else shared the story? Did your contact's name stand out? Did you congratulate him on being cited by an industry news source and/or discovered by Linked-In's algorithm? Or did you find this article in another way? Maybe the content and news was compelling enough that you forgot about Linked-In?